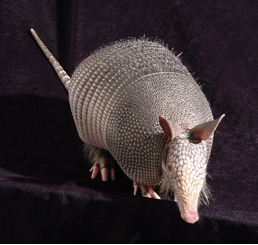 To Avoid Leprosy, Stay Away from Armadillos! MedicalResearch.com: What is the background for this study? Where can armadillos be found? What are the main findings? Response: The ancient disease leprosy, a disease causing skin lesions, nerve damage, disfigurement and disability, is caused by the bacterium Mycobacterium leprae, and is mainly spread by aerosol infection (coughing and sneezing) from human to human. It is rare in the United States (less than 200 cases on average per year), while it is endemic in Brazil, where over 25,000 new cases were diagnosed last year. In addition, zoonotic transmission of leprosy by nine-banded armadillos (Dasypus novemcintus, pictured at left) has been shown to occur in the southern United States, mainly in Texas, Louisiana and Florida.